Four posts in one week, and then nothing for three weeks. I have really got to get my act together. Part of the problem is that I was trying and trying to write about Azzaro Homme, which, for some reason, simply eludes me. But I received a staggering 46 scents last week (a shipment of half-ounce miniatures from Demeter and a whole bunch of little decants from a swapper--Kevin, yer awesome! ), and in the process of making up a bunch of my own decants to swap unearthed some things I forgot I even had, so now there's just no excuse, is there? 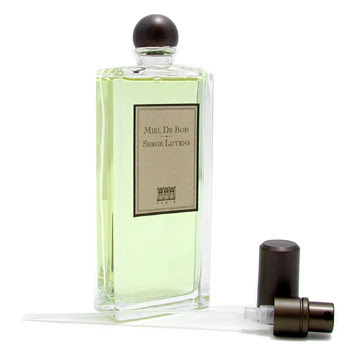 I was prepared to not like Serge Lutens' Miel de Bois ("Wood Honey"). A great many people simply hate it; a great many of the reviews on MakeupAlley are exclamations of unbridled disgust. "Chokingly sweet." "Immediate pain." "A latrine." "Dried up, bitter & rancid." The truth is, I was afraid to try it after reading so many bad things about it. I took Kevin's vial of the stuff and, with more trepidation than I am used to exhibiting (because I have sprayed Paris Hilton's creations on my skin, so you know I'm not afraid of much), dabbed a little on the back of my just-showered hand. And took a sniff. And laughed in delight. Sniffed a little more, grinning like an idiot. Let it sit for a few minutes, just to be sure, and then tipped more onto my hand so I knew I wasn't smelling just a fraction of the scent but the whole thing, opened up. And I am in love. The honey isn't just some generic honey, either: to my nose, it has the floral scent of acacia honey, which might be the hawthorn and iris notes. As the honey note slowly recedes, the floral notes take on more importance: the scent isn't a flower garden, but a tribute to the fact that honey is made of flowers. That polleny honeycomb is resting on a pile of woods: the official notes list ebony, guaiacwood and oak, but I can't tell the one from the other--only that as the honey seeps away, a strong, uncompromising wood note takes over. It's not pretty: it's ferocious and splintery. The overall effect of the scent is that of the entire universe of honey: the flowers that are its source, the honeycomb, the tree from which it hangs, and the honey itself. I had always read that Serge Lutens was an artist of scent, but I had never had a chance to really get to know any of his scents until now, and I can finally say that yes, this is the work of some extremely gifted people, geniuses, perhaps: Lutens, who I assume dreamed up the scent, and Christopher Sheldrake, the perfumer who made it happen. Miel de Bois is astounding: fiercely original, strange, daring. It is daring: it dares you to try it, dares you to love it. I do.